You are currently browsing the Bookmobile News weblog archives for July, 2015. We are thrilled to announce the renewal of major operational funding by the Ernest L. and Ruth W. Finley Foundation! Since 2012, their support has been fundamental to the execution of our important mission: Promoting literacy and love of reading by giving away high quality books throughout Sonoma County, especially seeking to serve children and seniors living in rural and low-income areas. The Finley Foundation has long been a tremendous force behind countless community benefit programs and facilities throughout the region. We very much appreciate not only the opportunity that Finley funding provides us to reach those who are challenged for access to books, but as well the strong statement of support for literacy and education that their grant represents. Thank you! It’s that time of the year again, when the Free Bookmobile is hard at work helping vulnerable children avoid the loss in literacy skills that can accompany the summer break. And hard at work behind the scenes are our friends at United Way of the Wine Country, who have once again partnered with Exchange Bank to collect high quality children’s books to boost our efforts. This is a great time to help your kids evaluate their collections and decide which books they have outgrown or won’t read again. Please bring them to us! There are lots of young minds out there eager to discover new books to read, eager to keep up their educational growth. Youngsters who can’t afford to shop at bookstores and from families that don’t prioritize trips to the library. Participating is easy: just pack up your contributions (banker’s boxes are best) and bring them to ANY Exchange Bank location in Sonoma County during business hours. There are clearly marked bins designated for United Way in each lobby, or you can tell any of the staff that your books are for the summer children’s book drive. ALL donated titles will come to the Free Bookmobile, to make sure our shelves are full of the best the community has to offer. We are already underway on a big outreach schedule — we promise to get your books into the hands of those who need them most! 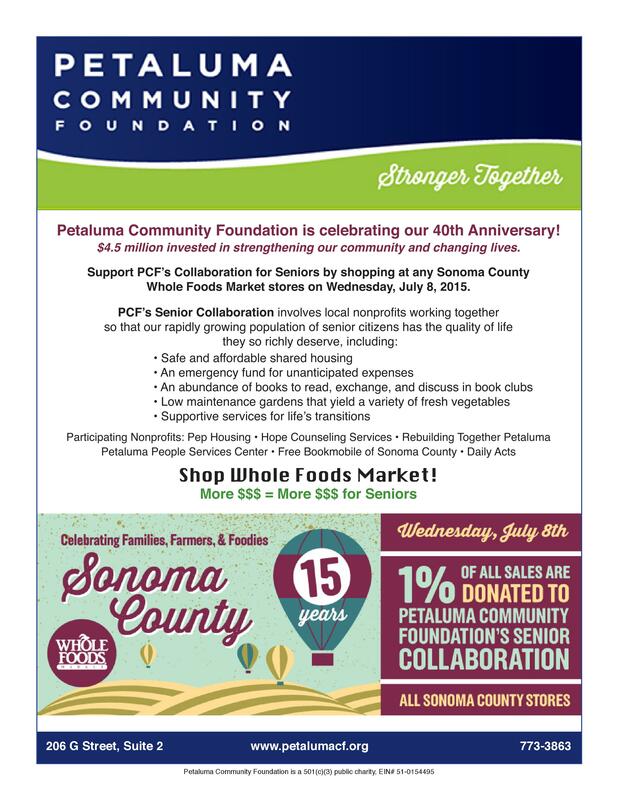 Our good friends at the Petaluma Community Foundation (PCF) have put together another strong collaboration, this time for our senior citizens! Please come out to support this effort by doing your shopping at any of Sonoma County’s five Whole Foods stores on Wednesday, July 8. PCF will receive 1% of all sales at all stores to put straight into this new Senior Collaboration. The Free Bookmobile, with it’s strong record of service to our community’s elders, will receive funding as an integral part of the project, which also features PEP Housing, Petaluma People Services Center, Hope Counseling Services, Rebuilding Together Petaluma, and Daily Acts. Check out the flyer below, feel free to distribute it throughout your networks, and come out on July 8 to support vital services for Petaluma’s seniors!